Definitely is the best and the cheapest Madrid City Tour. Its the best choice to enjoy Madrid together with our expert guides who will narrate you the curious stories and secrets of this mysterious city. Discover the historical, emblematic and modern Madrid with the Madrid City Tour. 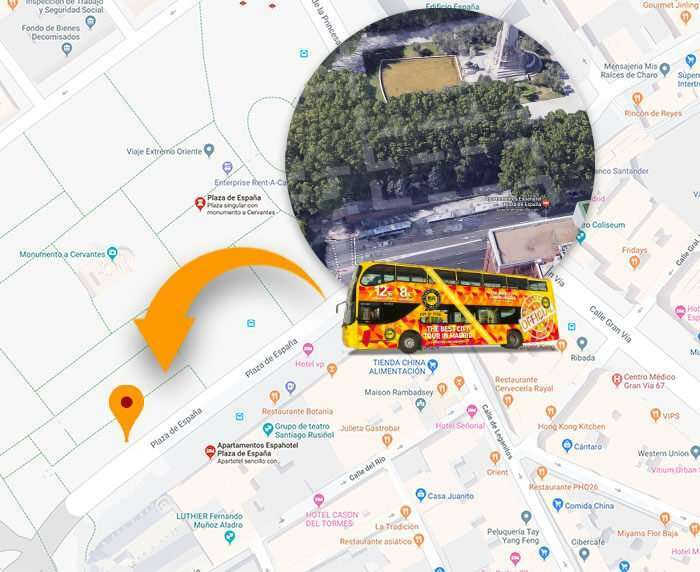 Enjoy the most characteristic monuments of Madrid.We will start our tour from Mayor Street and will cross the famous Puerta del Sol, the heart of the city, to reach the Plaza de las Cortes, we will go round the Plaza de Neptuno and the Retiro park which is one of the most significant places of Madrid, than we will get close the famous train station Atocha.From there we will cross the magnificent and artistic Paseo del Prado known as Paseo del Arte contemplating the Botanical Garden, the elegance of the Jeronimo's Church and the world famous Prado Museum. We will enjoy Cibeles Plaza, one of the most symbolic place of the capital, the National Library and Plaza de Colon the main attraction of the city of Madrid. Paseo de la Castellana is the business and financial center of the capital.Located on Paseo de la Castellana you will appreciate the famous Stadium Santiago Bernabéu owned by Real Madrid Footbal Club recent winner of the last Champions League.We will continue to the fashion part of the capital, Serrano Street, known as Golden Mile the best shopping in Madrid. The next attraction is the famous Gran Via Street, the cultural part of Madrid with the best theaters, performances and great musicals. In the same center of the Plaza de España you can find the monumental fountain dedicated to Miguel de Cervantes.The Temple of Debod is the curious attraction of Madrid, the stones were brought from Egypt one by one. It has a history of about 2,200 years.We will continue to Madrid de los Austrias where you can enjoy of The Royal Palace and The Almudena Church.The last attraction of the tour is the Puerta de Toledo., it was the last monumental gate erected on the former grounds of Madrid after that we will return to Mayor Street to finish our tour. 1:30 hours of the best panoramic tour of Madrid. Multilingual guide during the tour. Audio translating system: Spanish, English, French, German, Italian, Portuguese, Russian, Japanese. Bus 1 Starts from 10:15 a.m. to 4:15 p.m. Bus 3 Starts from 10:15 a.m. to 4:15 p.m.
All of them are started and finished at the same point.